The Cell-Surface Interaction, by J. S. Hayes, E. M. Czekanska and R. G. Richards. Studying Cell-Surface Interactions In Vitro: A Survey of Experimental Approaches and Techniques, by Stefanie Michaelis, Rudolf Robelek and Joachim Wegener. Harnessing Cell-Biomaterial Interactions for Osteochondral Tissue Regeneration, by Kyobum Kim, Diana M. Yoon, Antonios G. Mikos and F. Kurtis Kasper. Interaction of Cells with Decellularized Biological Materials, by Mathias Wilhelmi, Bettina Giere and Michael Harder. Evaluation of Biocompatibility Using In Vitro Methods: Interpretation and Limitations, by Arie Bruinink and Reto Luginbuehl. 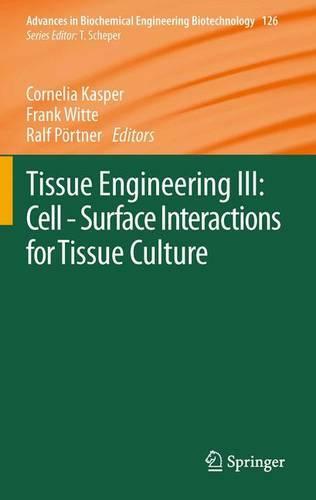 Artificial Scaffolds and Mesenchymal Stem Cells for Hard Tissues, by Margit Schulze and Edda Tobiasch. Bioactive Glass-Based Scaffolds for Bone Tissue Engineering, by Julia Will, Lutz-Christian Gerhardt and Aldo R. Boccaccini. Microenvironment Design for Stem Cell Fate Determination, by Tali Re'em and Smadar Cohen. Stem Cell Differentiation Depending on Different Surfaces, by Sonja Kress, Anne Neumann, Birgit Weyand and Cornelia Kasper. Designing the Biocompatibility of Biohybrids, by Frank Witte, Ivonne Bartsch and Elmar Willbold. Interaction of Cartilage and Ceramic Matrix, by K. Wiegandt, C. Goepfert, R. Poertner and R. Janssen. Bioresorption and Degradation of Biomaterials, by Debarun Das, Ziyang Zhang, Thomas Winkler, Meenakshi Mour, Christina I. Gunter, Michael M. Morlock, Hans-Gunther Machens and Arndt F. Schilling.